The Academy Award winning director of military blockbusters like “Platoon” and “Born on the Fourth of July” denounced the U.S. presence in Japan during a recent visit there. Oliver Stone called U.S. military bases in Japan “no longer necessary” during a discussion in Okinawa on Wednesday, Japan Daily Press reported. The event included a former Okinawa governor and other panelists on his trip that coincided with the 68th anniversary of Japan’s surrender to the Allied Forces, which ended World War II. 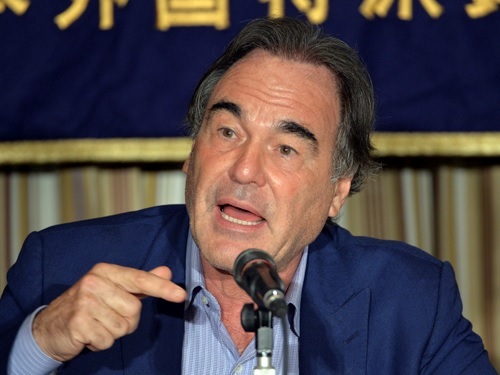 Academy Award winning director Oliver Stone speaks before press in Tokyo on Aug. 12. Stone visited the atomic-bombed cities of Hiroshima and Nagasaki last week as he published books of “The Untold History of the United States” with Peter Kuznick, professor of history at American University. Japan Daily Press reported that Stone visited Okinawa to learn more about the military base issue on the island. He said he believes the U.S. wants to maintain its military bases in the region to look for new enemies, according to the news outlet. Stars and Stripes reported that Stone even went as far as to say that Japan should disassociate itself from its defense agreement with the U.S. and further align itself with China. This wasn’t the first time Stone shared his opinions on the way things should be in Japan. Earlier this month, he urged Japanese youngsters to learn more about the Hiroshima bombing. He also called on the Japanese government to apologize for past wartime acts and said the country would be wise to avoid relying on military power in disputes with China or North Korea, JDP reported. Oliver Stone hasn’t learned much. Telling the Japanese to make friends with the Chinese is like pouring gasoline on an already raging fire. What the Japanese did to the Chinesse and the Koreans before and during the War will not be forgotten for many more generations. Why is his, Oliver Stone’s message important to the Marine Corps? Yea just what we need new enemies… I kinda sick of all our old enemies. Well we certainly need to cut back over there with all the downsizing planned. We don’t need most our Marines on Okinawa. Here is a detailed plan to close three bases there. Stone is an idiot. I challenge him to knock on my door and I will give him the education that he so desperately needs. Who cares what Stone thinks or says! He and his comments are irrelevant to Marine Corps. Hell, he doesn’t even rate being on this forum. Stone is a vocal supporter of WikiLeaks founder Julian Assange and supports Bradley Manning. He’s weak just like them both. For him to make those comments on foreign soil is pathetic. If you want to stand up for what you believe is right then do it, but be prepared for the fallout. It’s weird since characters in some of his movies did it in an admirable way even though I may not have agreed with them. Stone is right of course. Military brass said we couldn’t leave PI, until a volcano destroyed the bases, then it wasn’t so hard afterall. There is absolutely no need for advanced bases such as Oki any longer, never was. Didn’t help us much in RVN either. Still got whipped there. Once a douche, always a douche…….what the hell does he know about anything? Just because Oliver Stone is a successful film maker obviously doesn’t make him an expert on international affairs. Why are you giving him a venue for such nonsense? The Office of the SECDEF did a number of studies on this – he should read them. But of course he would not have time or the inclination to do so. Bottom line is that studies have shown that the other countries in Asia are still TERRIFIED of the Japanese and having us there is the only deterant that they feel comfortable with, otherwise there will be a spiralling nuclear arms race there, that in the potential outcome would make WW II look like a Sunday picnic. There is only one highly-educated opinion about the United States strategic foreign policy and military projection; it is not Henry Kissinger, Robert McNamara, or Colin Powell; it is Oliver Stone. Maybe you guys didn’t know, but he wrote “Platoon”. The US is trying the same tactics on China that it employed on the USSR a couple of decades ago. It’s trying to contain the country. Only it’s not going to work, because unlike Russians, Chinese are everywhere. They may have American passports but they still keep a connection with China. So, most American military push this tired old line about how much the Chinese hate the Japanese for what they did in the war. Those who remember the Nanking massacre are very, very few. Your average Chinese couldn’t care less. We are sick of the constant wars that the US involves the world in. Since 1940, your country has been at war, overtly and covertly all over the planet. Luckily there are some who throw light on the dark, secretive and corrupt organization that the US government has become. If we are to have freedom and democracy with any meaning, it’s going to take a few more Mannings and Snowdens. If we spent the same amount of money “defending” ourselves from those guys over there who are spending huge sums of money to “defend” themselves against us, we could create a Golden Age. We all live on the same planet, it’s easy enough for the man in the street to get on with his fellow men. Why can’t the military? What does this have to do with theMarine Corps. Oliver Stone doesn’t make policy so who cares. How about some news from the front? You know, like ‘Battle Rattle’? Outstanding “news” reporting again MCT…. Oliver has taken way to many drugs in his life. His brains are fried falls into the fried brains rubbish heap along with Timothy Leary.